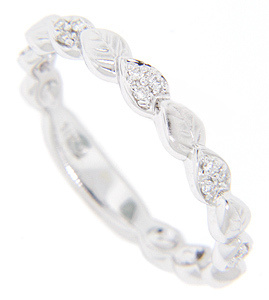 A repeating leaf design decorates these 14K white gold stackable wedding bands. 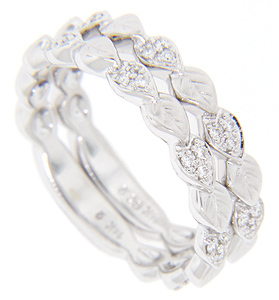 The pattern alternates between a matte finish, engraved leaf and a leaf set with sparkling diamonds. Each ring measures 3mm in width. 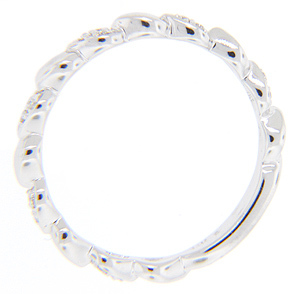 The rings are photographer here with R1515 (sold separately). Size: 6 3/4. We can re-size. 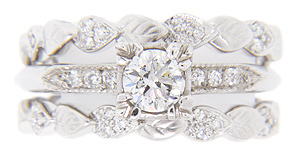 The bands are frequently purchased as a set for $1200.00 but they are also available individually.